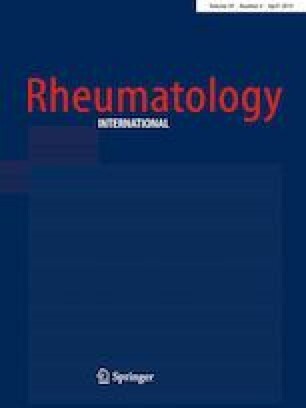 The aim of this study, based on a post hoc analysis of the data set used in the RAPID 1 trial, focuses on the associations between metacarpal bone mineral density, as estimated by digital X-ray radiogrammetry (DXR), and clinical remission as well as ACR70-Response in rheumatoid arthritis (RA) patients treated with certolizumab pegol (CZP). The trial evaluates a total of 345 RA patients treated with methotrexate versus CZP 200 mg versus CZP 400 mg. All patients underwent X-rays of the hand at baseline and week 52 as well as computerized calculations of bone mineral density (BMD) by DXR. Clinical remission was defined as DAS28 < 2.6. ACR70-Response was also evaluated. The radiological assessment of disease progression was estimated using the modified total Sharp Score. The mean difference for DAS28 was observed for patients treated with CZP 400 mg (median: − 3.53, minimum: − 6.77; maximum: + 0.48) and CZP 200 mg (median: − 3.13, minimum: − 6.37; maximum: − 0.52) compared to the methotrexate group (median − 2.41, minimum: − 4.76; maximum: + 0.31). The DXR-BMD showed a minor bone loss for the treatment groups undergoing therapy with CZP 200 mg (median: − 0.009 g/cm2, minimum: − 0.059 g/cm2; maximum: + 0.095 g/cm2) and CZP 400 mg (median: − 0.008 g/cm2, minimum: − 0.064 g/cm2; maximum: + 0.080 g/cm2). The methotrexate group presented an advanced periarticular metacarpal bone loss as measured by DXR-BMD (median: − 0.024 g/cm2, minimum: − 0.102 g/cm2; maximum: + 0.057 g/cm2). In the case of clinical remission and ACR70-Response, no significant change of the DXR-BMD was observed for both CZP groups. The study highlights that patients treated with CZP show a less accentuated periarticular bone loss as estimated by DXR in comparison to patients with methotrexate plus placebo. In addition, patients with clinical remission and ACR70-Response revealed no periarticular demineralisation. The authors thank Monika Arens (Managing Director, Arewus GmbH) and Jacob Algulin (Managing Director, Sectra, Sweden) for the use of the Digital X-ray Radiogrammetry technique. Further thanks to Thomas Lehmann (PhD) for the statistical advice. Also many thanks to Dr. Natalia de Peyrecave (UCB Pharma, Brussels, Belgium), Dr. Anja Schwarz (UCB Pharma GmbH, Monheim, Germany), Dr. Udo Lendl (UCB Pharma GmbH, Monheim, Germany), Dr. Hans-Joachim Kreutzenbeck (UCB Pharma GmbH, Monheim, Germany), and Dr. Robert Reinhold (UCB Pharma GmbH, Monheim, Germany) for the support in performing the Investigator Initiated Study performed in Jena and for the helpful critical discussion of the data. AP designed the study, analyzed the radiographs, performed the statistical analysis, wrote the manuscript, and revised the manuscript. AN performed the BX-measurements and participated on the statistical analysis as well as on the study design. DR analyzed the radiographs, interpreted the radiograph data, and helped to draft the manuscript. CJ performed the statistical analysis and interpreted the data. LR performed the data collection and participated on the statistical analysis. PO edited the manuscript. AM printed the radiographs and evaluated the radiographs. GW interpreted the data and edited the manuscript. JB participated on the study design, read the hand X-ray, and wrote the manuscript. All authors read and approved the final manuscript. This study is a part of the Investigator Initiated Study “The quantification of inflammatory related periarticular bone loss in certolizumab pegol treated patients with rheumatoid arthritis” which is funded and supported by UCB Pharma GmbH, Monheim, Germany (number: IIS-2014-101458). All procedures performed in studies involving human participants were in accordance with the ethical standards of the institutional and/or national research committee and with the 1964 Helsinki declaration and its later amendments or comparable ethical standards. Ethical approval was obtained at each site as described previously . The study protocol including the prespecified analysis of X-rays was registered in clinical trials.gov (trial identifier: NCT00152386). In addition, all examinations were performed in accordance with the rules and regulations of the local Human Research and Ethics Committee of the Friedrich-Schiller-University Jena. The study is a retrospective post hoc analysis of data sets which are considered in the RAPID 1 trial . Based on the regulations of the ethics committee of the Friedrich-Schiller-University Jena, a registration and a separate consent from any patient were not necessary.